As the situation in southern Israel escalates, Hamas' military wing announces the artificial ceasefire with Israel is over. 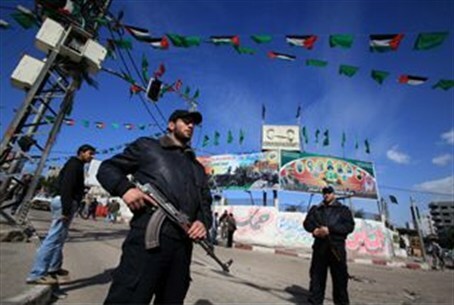 Hamas’ military wing, the Al-Qassam Brigades, called off a ceasefire with Israel late Friday, Hamas’ Al-Aqsa radio reported. According to the report, which was quoted by the Bethlehem-based Ma’an news agency, Hamas will allow terror factions in Gaza to respond to Israeli attacks in the Strip. Those ‘attacks’ come in response to provocations by the same terror groups in Gaza, such as Thursday’s multiple attacks near Eilat or the barrage of rockets which were fired at Israel from Gaza on Friday. The ‘ceasefire’ had been declared by Hamas following the IDF’s Operation Cast Lead in Gaza in 2009, but has been broken many times when terror groups fired rockets and missiles towards Israel’s southern communities. More than 20 rockets, missiles and mortars were fired by terrorists from Gaza into Israeli territory on Friday. Most of them exploded in open areas and did not cause physical injuries or damage. In at least one case, the Iron Dome defense system was able to shoot down a rocket before it hit the city of Ashkelon. One attack on the city of Ashdod resulted in a rocket landing in a synagogue and a nearby yeshiva in the city. Several people were wounded, two severely. The IAF retaliated several times, identifying terror targets and striking them.